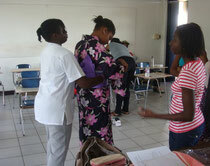 UTCH Japanese club members challenged ‘ Kitsuke’, wearing Yukata, and practiced Japanese traditional dance ‘Bon Odori’ for Japanese festival to be held on November in Jamaica.Their skill good memory surpprise me as usual. Hope not forget at festival! !